Ralph Hanson January 14, 2009 Comment Now! 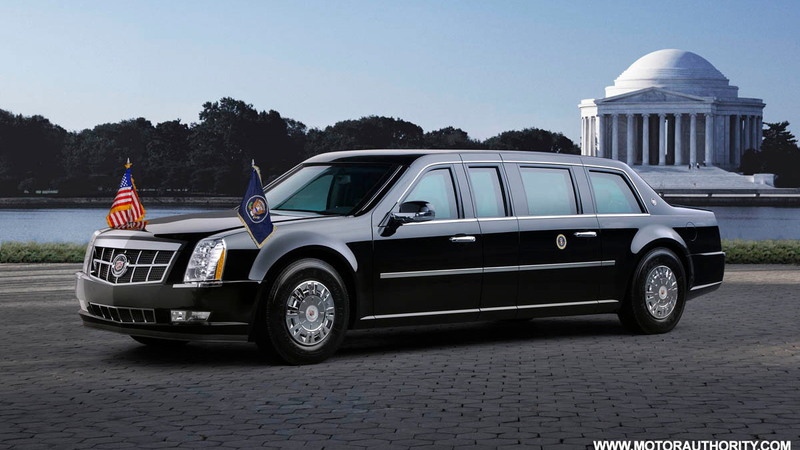 With president-elect Barack Obama soon to be sworn in as the nation’s leader, a new presidential limousine was in call for and once again General Motors was assigned the task of building it. Nicknamed ‘The Beast’, the limo is based on a number of GM platforms and shares components with several different vehicles. Its exterior is styled around the Cadillac STS and DTS but underneath the sheet-metal the vehicle is built on a medium-duty truck chassis. The limo has recently been seen testing in prototype form alongside several GMC Topkick pickups, and according to onlookers the wheels and tires on the limo are almost identical to those on the trucks – 19.5in Goodyear Regional RHS tires. The rest of the exterior includes parts from several Cadillac models, such as headlights from an Escalade, and the grille and taillights from an STS. The panels are comprised of dual-hardness steel, aluminum, titanium and ceramic material to help break up projectiles aimed at the car. Inside, the car features the same cut-and-sewn handmade leather upholstery found in the CTS. The rear passenger area includes an extensive executive compartment with ample seating space, outward visibility and useful mobile office features. An embroidered presidential seal is positioned in the center of the rear seat back panel, as well as on each rear door trim panel. 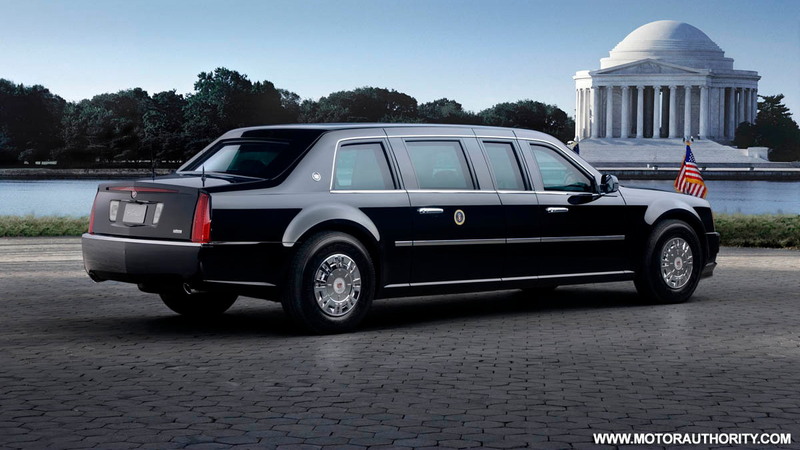 Presidential seals are also affixed to the exterior rear doors. 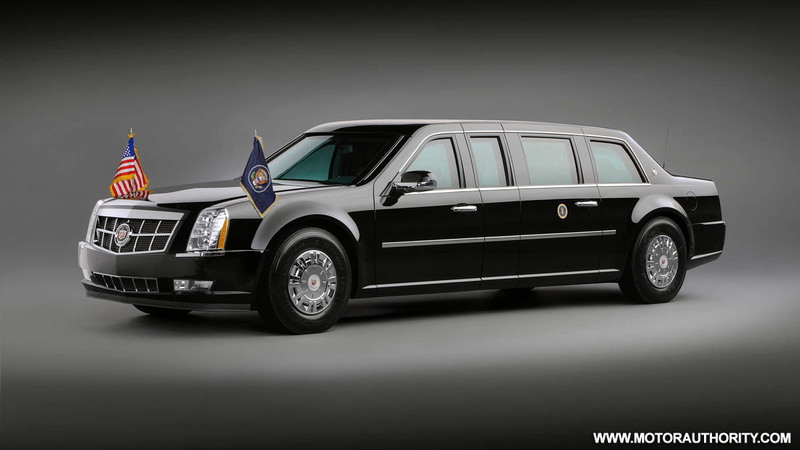 Other safety and high-tech features include 8in thick armor-plated doors (each weighing the same as a cabin door on a Boeing 757), an independent oxygen supply and advanced fire-fighting system located in the boot, pump-action shotguns, night-vision cameras and tear-gas cannons, Obama’s own personal storage of blood, Kevlar-reinforced tires that are puncture and shred-resistant, and special steel wheels that can drive without the tire attached. All of this comes at a heavy weight penalty, with top speed rated at 60mph (96km/h) and fuel-economy expected to be about 8mpg. 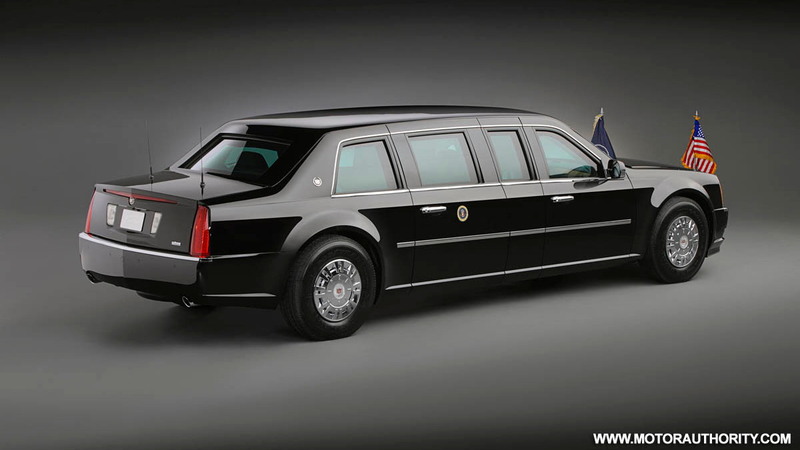 Obama will first use the limo when he travels along Pennsylvania Avenue in Washington after his inauguration.